There has been much talk about the National Assembly’s silent deputies, which has led to discussions about how to improve the quality of the work done by the people’s elected representatives. Along with legislation and deciding on major national issues, one of the most important roles of the National Assembly is scrutiny. According to the NA deputies themselves, there has been an improvement and positive results with the assembly's work. However, the quality of scrutiny has not always proved to be very effective, especially in terms of the struggle against corruption. So not a single deputy or delegation has detected corruption in their areas? If the National Assembly had had better supervisory powers, maybe the consequences of corruption at Vinalines and Vinashin would not have been so severe? The question is who is supervising the National Assembly? The immediate answer lies with the public and the political and social organisations. 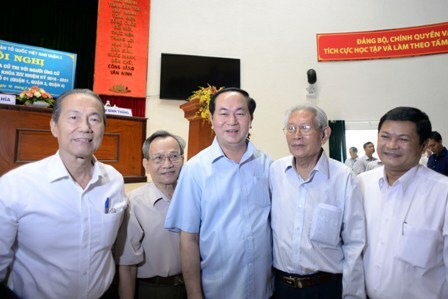 On May 10, Ha Hanh, a voter from HCM City asked President Tran Dai Quang why the National Assembly’s powers of scrutiny and ability to supervise developments in the country were so weak. "Many complaints and requests from the people are not properly dealt with. State agencies do not fulfil their responsibilities to the public. The NA deputies never seem to mention the complaints made by businesses at the meetings. Public servants made many promises but never realise them," he said. Hanh proposed to supervise what promises that state officials and deputies make, including in their personal manifestos. The National Assembly holds the supreme power, but this power also has limits. The assembly is elected by the people, it represents the public. The power does not belong to any individual in the assembly. That's why the assembly must also be supervised. In reality, the National Assembly has been scrutinised, through live broadcasts of the assembly's Q and A sessions and meetings. There has also been many complaints about silent deputies who contribute nothing to meetings. On May 4, voter Truong Cong Binh from Can Tho City told the NA Chairwoman Nguyen Thi Kim Ngan he wasn’t impressed by the times he saw deputies chatting or sleeping during live broadcasts of National Assembly sessions. Even the deputies are asking for tighter supervision. It's time for the assembly to set up a system to let voters supervise the deputies and officials they elect. After each term, the works of deputies and officials should be evaluated to avoid situations where too many promises are made but few are realised.